"I've been fascinated to try and unlock the secrets of the germline for many, many years now as I think the genetic and epigenetic health of our germline cells is critical to the health of our children." Amander Clark, Ph.D, a professor in the Department of Molecular, Cell and Developmental Biology at the University of California, Los Angeles, is a germline biologist who explores the fundamental mechanisms required for germ cell development in order to understand infertility and diseases in children that originate from the germ line cells of their parents. Her lab uses human and mouse embryonic stem cells together with animal models. 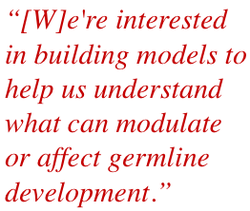 Clark wants to model the molecular events critical for normal human germ cell differentiation and function in order to fully grasp the nature of any germline disruption. Originally hailing from Australia, Clark conducted her Ph.D research in anatomy and cell biology at the University of Melbourne. After completion of her degree, she spent time at Baylor College of Medicine in Texas and the University of California, San Francisco for her postdoctoral fellowships. Interviewed by Meeri Kim, PhD, April 2014. You study the development and reprogramming of the human germline. How did you become involved in this field? I don't know how far you want me to go back, but I have always been interested in science since I was a very young girl. Although initially I didn't know what kind of scientist I wanted to be, I did grow up on a farm in rural Australia and always had an interest in biology. When I went to the University of Melbourne for my undergraduate degree, I started to take courses in cell and developmental biology. I found myself particularly fascinated by the process of embryo formation, and how different cell types became specialized in the embryo. That eventually led me towards studying the formation of the germline. As germ cells are the origins of life. From a scientist's perceptive, germ cells are such fascinating — and such crucial — cell types. These cells are responsible for safeguarding our genome between generations, and this is something we still don't understand completely. I've been fascinated to try and unlock the secrets of the germline for many, many years now as I think the genetic and epigenetic health of our germline cells is critical to the health of our children. What are some of the scientific questions in the field that you hope to find answers to, through your lab's work? My overarching research goal is understanding how infertility arises in the human population — but as a part of that, we're interested in building models to help us understand what can modulate or affect germline development. So, for instance, a situation where you still get a germ cell, but that germ cell has acquired an epigenetic history that is a little different than what was intended. We're very interested in finding out how that happens. In order to make those kinds of discoveries, we must first figure out how to build models that allow the germline to be scientifically accessible to questions of infertility or origins of disease, and how such things can be passed on to the next generation. When I began my lab at UCLA in 2006, we first started working on building a model using human pluripotent stem cells to understand early events in human germline formation. But very quickly, we realized we were hitting bottlenecks because we actually didn't know anything about the human germline at all. Instead we were relying on other model organisms that scientists use in order to figure out what human cells were doing. From there, we started a project that revolved around understanding the human germline better. In the last five years, we have done a complete characterization of the human germline for the end of the first trimester through the beginning of the second trimester. We studied those time points in particular because we were able to obtain donated tissue to our research program within that time frame. In order to characterize the human germline, what was involved? What were some of the methods you had to use? That's a really good question. For one, we discovered that germline cells make up a very small fraction of the developing ovary and testes. This meant that we needed to figure out how to take a sample, separate it into single cells, and then figure out which ones are the germ cells. So before going any further, we had to develop special approaches to do that. We ended up using separation-based methods relying on unique proteins found on the surface of the human germline cells in order to very accurately and specifically separate out the human germline cells from all the other cells. From there, we could study the germ cells in isolation. 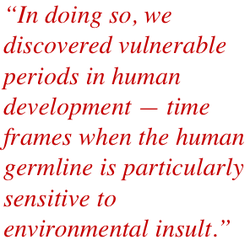 In doing so, we discovered vulnerable periods in human development — time frames when the human germline is particularly sensitive to environmental insult. What are the primary windows of vulnerability in female germline development? In male germline development? Why, on a molecular level, are these critical windows? The chemical structure of DNA in the germline is very different to other cells in our body. One of the four main bases found in DNA, called cytosine, can undergo covalent modification with a methyl group. This methylation is usually found in the DNA of all cells in our body. This chemical modification of cytosine is really essential to protect our DNA from damage or to prevent transcription of RNA. But in the male and female germline, this covalent modification of cytosine is considerably reduced. From as early as we can tell, which is 6 weeks in development, the germline DNA is made up of almost all unmodified cytosines. This phenomenon of removing cytosine methylation is known as reprogramming. Reprogramming happens in both males and females, but we find that the removal of cytosine from the genome in males occurs about a week-and-a-half later than in females. Because the DNA of the human germline early in embryonic life is enriched with unmodified cytosines, this means that the DNA in our germline is very sensitive to environmental damage starting from 6 weeks of development, at least, since those protective effects of methylation are close to nonexistent. We also discovered that as you move into the second trimester, the small amount of remaining methylated cytosines slowly get removed later on in the same trimester. It is a controlled process, and we are very interested in understanding how and why this happens. Could you give some examples of environmental factors might disrupt the molecular programming of the germline? Endocrine disruptors — it is very clear that these will disrupt the formation of the female germline and cause meiotic defects as well as change the epigenome of male germline cells. But the challenge remains — and this is the reason why models are so important — that it is very difficult to study the effect of an environmental agent on the germline. It’s a challenge to give an agent to an organism and then study the germline of that organism weeks or months later as it does not provide specific information as to when and how the agent acted to change the germline. There is a dearth of models for precisely studying errors in germline development, and these would be powerful accompaniments to whole organism studies. This is really something that's missing in the scientific community — and that's the piece my lab is trying to fill in. You mentioned that development of other mammalian germlines are better understood than that of humans. In what aspects are humans different? In terms of what's different from humans, of course the timing is different. In mice, you're talking about events that happen within hours and days, while in humans, you're talking about weeks and months. 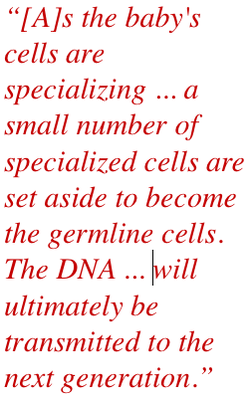 Some of the phenomena that we observe in the human germline is also occurring in the mouse germline. In particular, we found that the big loss of methylated cytosines from the genome happens both in mice and humans — but again, in mice this is occurring within hours and days as opposed to weeks and months. The second phase of demethylation, which is a second period of vulnerability, is also seen in the mouse. It occurs over a 1-2 day window; in humans, we see it happening over 6-8 weeks. Because the timing is different, we anticipate that some aspects of the regulation of these events will be slightly different between the two species. There has to be some pathway controlling the process of removing methylated cytosines from the genome, or alternatively, protecting methylated cytosines from being removed until a later date. That's not random, and this is all occurring in a controlled fashion. As a scientist, I'm trying to figure out the molecules that are enforcing this exquisite control. How is it that a pregnant woman has three generations of DNA that coexist in her body? 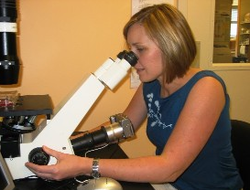 How do germ cells develop within a fetus? As a baby is developing in utero, it has its own DNA that it inherited from mum and dad. But as the baby's cells are specializing and becoming various cell types in the body such as cartilage, brain cells or heart cells for example, a small number of specialized cells are set aside to become the germline cells. The DNA in that baby's germline cells will ultimately be transmitted to the next generation after that baby grows up and has a family. From early studies in the 50's, we know that a baby's germline cells are set aside at the same time as other major cells in the body during the embryonic period right after implantation. As the baby fetus grows in utero and starts to form hand and foot plates, the gonads (either ovaries or testes) will start to form inside the body. Ultimately, at around the 4 to 5 weeks of development — so about the 6th week of pregnancy — those germline cells will start to migrate into the newly formed ovary or testes and the germline cells will stay there from now on. At this point, we know that throughout the whole series of events — migration of cells, entrance into the gonads, hand and foot plate development — those methylated cytosines have already been removed from the germline. Then, once those germline cells are in the ovary or testis something very special happens: the female germline stops dividing and will never divide again. That's as many immature egg cells as a baby girl will ever make. However, the male germline continues to divide slowly, but ultimately they will also stop dividing and become stem cells. Then they will start to divide again during puberty. Tell me about an ongoing project that you are excited about. We think we have identified the control mechanism that removes cytosine methylation from a baby's germline soon after it forms. If this result proves true, we will now have a candidate to test when considering projects on environmental disruptors of the germline. Specifically, we can ask what effect an environmental agent has on this particular control. It gives us a very specific handle on how an agent could be affecting a baby's germline during gestation, and from this we can start to figure out the rest of the pathway. If we have no understanding of the fundamental controls required to make a neuron, or a germ cell, or what makes a neural cell form connections for example — then all the environmental work on predicting the underlying mechanism caused by an environmental agent is guesswork. I think all of us recognize that the environment is important, but until we have a really good handle on the controls for lineage specialization, it is very hard to figure out the interaction between environment and adverse outcomes to cell and developmental biology. The two fields need to be working hand-in-hand and that is starting to happen. Overall, I think that there has been a great deal of progress made within the last five years, so I am excited about what we will learn in the future.